Morphological analysis of contracting and quiescent adult rabbit cardiac myocytes in long-term culture. the organization and maintenance of the adult cardiac phenotype. Although considerable effort has been expended de0 1990 WILEY-LISS, INC.
maintained a rod-shaped configuration while spreading over the culture substratum and exhibited no contractile activity except when cultured a t high densities. Received June 30, 1989; accepted November 2, 1989. School, 303 E Chicago Ave., Chicago, IL 60611.
the heart cell in quiescent and contractile myocytes. 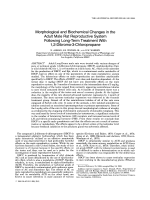 the adult phenotype in vitro. previously (Decker et al., 1988a). rinsed again and then en bloc stained in aqueous uranyl acetate (0.5%) to enhance membrane contrast. 1988a) were stained with uranyl acetate and lead citrate and viewed with a JEOL 100 CX electron microscope. 7.5% sucrose, postfixed in buffered 1% OsO,, and stabilized with 1% tannic acid and 2.5% uranyl acetate. for 90 seconds) to remove rounded, non-viable cells. supplemented with 5% fetal calf serum and antibiotics. a s described previously (Haddad et al., 1988a). close contact (arrows) with one another (Fig. 1).Phase contrast (Fig. small blebs (arrowheads) emerging between the costameres (Fig. 5). Fig. 4, X 840; Fig. 5, X 5075; Fig. 6, X 12,000.
stain with trypan blue after a 2 hr. incubation in fresh medium. ‘Values are means ? S.E. for 5 cultures exposed to lOuM Ara-C. Values represent mean number of round cells as % of total counted cells for 5 cultures. gradually spread into a highly flattened configuration. during prolonged culture (Table 1). junctions at this time (Fig. 12). and only a few sarcolemmal blebs of the variety encountered at day 1are visible. Figs. 7-1 2. The changes in myocyte structure after one day in vitro. rnyofibrillar apparatus (M) which is confirmed in thin-sections (Fig. decorated with a few blebs (arrows) similar to those seen earlier (Fig. 10). Areas of close contact also develop between adjacent cells (arrowheads) but no junctions are apparent. (Fig. 12). Figs, 7, $, x 650; Fig. 9, x 1,200; Fig. 10, x 975; Fig. 11, X 3,300; Fig. 12, X 10,600.
x 25,000; Fig. 19, x 20,000; Fig. 20, x 25,300.
merous polysomal profiles that are not normally en- display numerous caveolae (Fig. 24). Peripheral T-tucountered in adult myocytes (Figs, 17). rather abruptly lose their sarcomeric organization and inset). plasmic reticulum is transformed into a branching ar- “normal” myofibrils displaying uniformly spaced, Zray typical of smooth endoplasmic reticulum which in- lines (Fig. 27) are often observed in electron microtermingles with rough endoplasmic reticulum (Fig. graphs along with abnormal myofibrils with irregu17). filaments amongst the actin thin filaments (Fig. 30). ing a t a rate of 150 beats per minute. Such cultures displaying disorganized myofibrillar elements (Fig. paired myocyte cultures where a significant number of reticulum associated with the remaining intact myomyocytes have detached remain quiescent and fail to fibrils retains its plexiform morphology (Fig. 31). beat even when maintained indefinitely. transformed into well developed, branching processes present in 14-day-old beating cells (cf. Fig. 23 with Fig. 2-lines (Figs. 23, inset; 25); T-tubules (T) appear to develop as basolateral invaginations (arrowheads) of the sarcolemma (Figs. 23, 24). inset). Saggital sections also show apical and basal caveolae (c) (Fig. coated vesicles (cv) are also visible (Fig. rarely well developed (arrow) when viewed in en face sections (Fig. x 34,000; Fig. 32, x 31,000.
endoplasmic reticulum content and the presence of numerous lysosomal residual bodies (Fig. 34). processes of the flattened, non-beating myocytes (Fig. 35). cytoplasm and not associated with the minute myofibrils. contractile cells, numerous polyribosomes are readily apparent in the sarcoplasm (Fig. 37). degradation will be required to verify this hypothesis. and flatten a s culture is prolonged. At 2 weeks, fluorescence (Figs. 28, 29) and thin-section images (Figs. al., 1989a)-whether such myocytes retain a contractile potential awaits further investigation. into a tubulo-vesicular configuration somewhat reminiscent of smooth endoplasmic reticulum seen in steroid secreting cells (Fig. 32). than freshly isolated cells (Decker et al., 1989a). high density, some of the preparations commence beating synchronously between day 10 and 12 of culture. that regulates the composition and structure of the contractile apparatus in the isolated heart cell. In this regard, Cooper’s recent results also bear importantly on the issue of “load” (Cooper et al., 1986). service grants HL 33616 and HL 19648 and the Feinberg Cardiovascular Research Institute of Northwestern University Medical School. providing our laboratory a sample of the CM-52 monoclonal anti-myosin antibody. 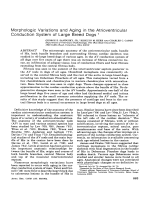 Borg, T.K., and L. Terracio 1988 Cellular adhesion to artificial substrates and long term culture of adult cardiac myocytes. In: Biology of Isolated Adult Cardiac Myocytes. W.A. Clark, R.S. Decker, and T.K. Borg, eds. Elsevier, London, pp. 14-24. T.K. Borg, eds. Elsevier, London, pp. 268-271.
myocytes in cell culture. Circ. Res., 64:493-500. 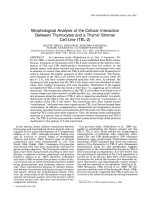 1982 Species correlations between cardiac isomyosins: A comparison of electrophoretic and immunological properties. J. Biol. electron microscope study. Dev. Biol., 80r446-482. Cooper, G.W., W.E. Mercer, J.K. Hoober, P.R. Gordon, R.L. Kent, I.K. adult feline cardiocytes. 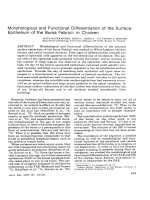 The role of substrate adhesion. Circ. Res. adult rabbit cardiac myocytes. Circ. Res., submitted. Decker, R.S., M.L. Decker, D.G. 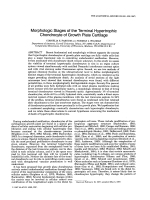 Simpson, and M. Lesch 1988a Morphological approaches to the study of freshly isolated and cultured adult cardiac myocytes. In: Biology of Isolated Adult Cardiac Myocytes. W.A. Clark, R.S. Decker, and T.K. Borg, eds. Decker, M.L., D.G. Simpson, M. Lesch, J. Jones, E. Beyer, and R.S. adult cardiac myocytes. J: Cell. Biol., 107t555a. morphometric analysis of cultured rat ventricular myocytes. J.
C.A. 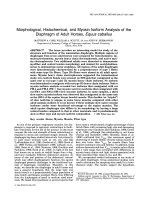 Dechesne, and H.M. Eppenberger 1988 Immunocytochemical analysis of the regeneration of myofibrils in long-term cultures of adult cardiomyocytes of the rat. Dev. Biol., 13O:l-15. Fischman, D.A. 1967 An electron microscopic study of myofibril formation in embryonic chick skeletal muscle. J. 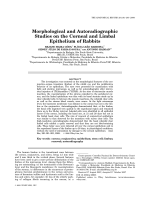 Cell Biol., 32557575.
structural variations in the mouse. J . Ultrastruc. Res., 58.50-65. R.S. Decker, and T.K. Borg, eds. Elsevier, London, pp. 292-296.
cells from adult rats. Cell Struct. Funct. 2.1-9. T.K. Borg, eds. Elsevier, London, pp. 394-397.
culture conditions on cardiomyocyte development in uitro. In: Biology of Isolated Adult Cardiac Myocytes. W.A. Clark, R.S. Decker, and T.K. Borg, eds. Elsevier, London, pp. 276-279. J.K. Hoober, and G. Cooper 1985 Biochemical and structural correlates in unloaded and reloaded cat myocardium. J . Mol. Cell. exchange, structure and function in myocardial tissue culture. cells. Am. J. Physiol., 252:H314-H324. J.V. Walsh, R. Witsien, A.W. Jones, J.C. Walker, M. Poemie, F.
physiological model. Am. J. Physiol., 253tC349-C363. properties of adult feline cardiocytes: Growth induction by cellular deformation. Circ. Res., 64r1079-1090. cells in culture. Circ. Res., 64:542-553.
cells. Am. J. Physiol., 249:H731-H735. differentiated adult rat cardiac muscle cells in culture. Am. J .
ventricular muscle cells. J . Ultrastruct. Res., 81:358-374. Moses, R.L., and W.C. Claycomb 1985 Ultrastructure of the transverse tubule system in cultured cardiac muscle cells. Dev. Cardiol. Med., 49t422-440. culture of adult mammalian cardiac myocytes. Electron microscopic and immunofluorescent analysis of myofibrillar structure. J . Mol. Cell. Cardiol., 15t301-317. cardiomyocyte development in long-term primary culture. J . Mol. individual cells isolated from adult rat ventricular myocardium. in cell culture of myocardial cells of the adult rat. J. Mol. Cell. T.K. Borg, eds. Elsevier, London, pp. 301-305.
primary culture. J. Mol. Cell. Cardiol., 21:175-185. 1984 Atrophy reversal and cardiocyte redifferentiation in reloaded cat myocardium. Circ. Res., 54t367-377. mechanically unloaded myocardial cell. Anat. Rec., 200r271-280. actin. Proc. Natl. Acad. Aci. U.S.A., 76t4498-4502.